At the end of the agreement there are three options: i) pay the optional final payment and own the vehicle; ii) return the vehicle: subject to excess mileage and fair wear and tear, charges may apply; or iii) replace: part exchange the vehicle. With Solutions Personal Contract Plan. 18s+. Participants must book a test drive and place an order between 1 April and 8 July 2019 with a participating Dealer. Retail sales only. May be redeemed against the on the road price of a new SEAT vehicle. Participating UK Dealers only. Contact your Dealer for further details, including details of if and how the offer may be combined with other offers. This offer may be varied or withdrawn at any time. When you choose Johnsons for your next new SEAT, you'll enjoy a full selection of the carmaker's latest vehicles. You'll find it simple to find one to meet all your driving needs, and our passionate and knowledgeable advisers can help you make sure this happens. The Spanish brand's line-up encompasses a broad variety of models, including compact hatchbacks such as the Ibiza and Leon, the Toledo saloon and the Alhambra MPV. Each shares traits of quality craftsmanship and affordability, and even greater value is added by our finance plans. 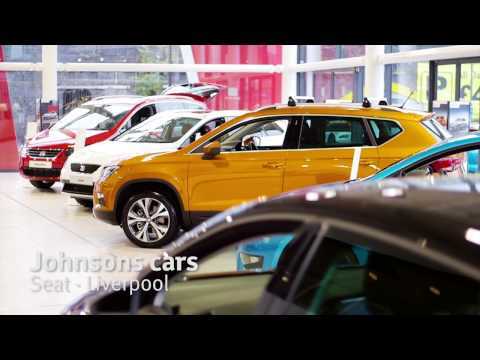 Our teams in Wigan, Liverpool and Preston will help you to browse all available cars, and explain the benefits of purchasing through a finance agreement from Johnsons. They will also be happy to schedule a test drive when convenient. Click through the links below to view specification details before enquiring to take the next steps.